A new year, a new book, new kinds of writing and teaching. And new thoughts about connecting with the world, including a new web site. I’ll be writing more about all these things, but for now — welcome to ruththompson.net! … or order from any bookstore. Saddle Road Press Books are distributed nationally and internationally by Ingram. Here’s the link to the SADDLE ROAD PRESS page with downloadable press release and cover image. DESCRIPTION: At the beginning of Whale Fall & Black Sage, “three strange angels” command the poet: Go down./ Now you must love that too. She descends into the darkness of whale fall, with its strange creatures both real and imaginary, then journeys through harsh, transformative landscapes of desert and mountain, deeper and deeper into the numinous body of earth. In Whale Fall & Black Sage, the natural world of Here Along Cazenovia Creek has deepened and become transformative. The book ends with a joyous, fully embodied Whitmanesque crow. “Whale Fall & Black Sage traces the path into our deepest territory, that realm in which there is no separation between darkness and light, between utter undoing and coming into being. These poems are “full of all the voices she can carry” and they hold together both the stern lesson of whale fall, “Go down. / Now you must love that too,” and the crow-companion’s glinting “song of being alive and fine to see.” Their journey is the heroine’s journey, sacred, dark and shining.” Diane Gilliam, author of Kettle Bottom and Dreadful Wind & Rain. “Storyteller, mythmaker and muse, Ruth Thompson uses daring diction and uninhibited voice to create this seamlessly blended two-part world of death, danger, magic and jubilation. What a rich and original metaphor is the re-purposed whale body. What an exuberant song is the woman rising from the imperfect body of self and world. In this bright, witty, and fierce collection, we join the poet as she discovers and celebrates what it means to be alive.” Barbara Rockman, author of Sting and Nest and the forthcoming to cleave. 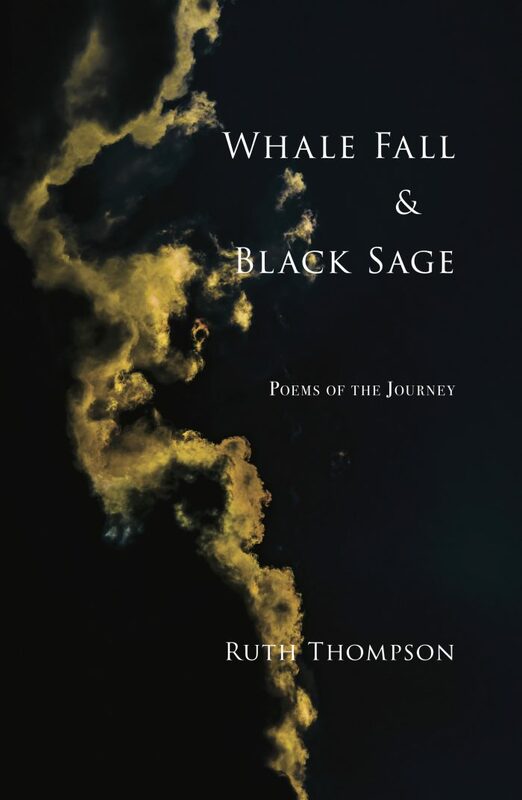 “Ruth Thompson’s collection, Whale Fall & Black Sage: Poems of the Journey, are wise poems that thread and weave through a mythic mapping of the self. The poems shape a body that travels through light and dark, hunger and nourishment, in order to save the self against isolation and desolation. These poems are, ultimately, about renewal, about following a songline “of being alive and fine to see” in order to find our way home.” Maura MacNeil, author of Lost Houses and A History of Water. “Ruth Thompson’s very beautiful poems about Ruths and Whales and Bears and even Minotaurs are prayers we all need, prayers she gives us here in all she sees. And we thank her.” Esther Cohen, author of Breakfast With Allen Ginsberg and many other books.